Unlike diamonds mined from the earth, pearls develop organically in mollusks, such as clams, mussels and oysters, living in water. The pearl formation process is basically the same in all mollusks. Most pearls come from oysters. It’s unusual for clams and mussels to produce pearls, but it is possible. Only one in 5,000 clams forms a pearl, according to Tungsten Jewelry. When they do, the pearl is quite valuable. Claims form two types of pearls—natural pearls and quahog pearls. Freshwater clams produce natural pearls. Natural pearls lack the high luster of cultured pearls and aren’t uniform in shape. These pearls vary in color, but white and pink are the most common. Quahog clams, also known as Littleneck clams, produce quahog pearls. The clams are indigenous to the East Coast of the United States. Quahog clams are saltwater clams—the kind you’d find at a raw bar. The pearls formed by these clams are naturally stained purple. Like natural pearls, quahog pearls are irregularly shaped. Clams can form pearls because of their shells. A clam's shell has two half shells joined by a hinge, which is called bivalve. The shell holds the clam’s soft body, a small foot, a gland and gills used to breathe. Clams feed by continually opening and closing their shells to allow water to filter through. The water contains food for the clam. However, it’s this feeding process that also makes the clam vulnerable to irritants, which enter the shell when it’s opened. Irritants serve as the basis for a pearl to form. When an irritant, such as a piece of shell, parasite or some other particle enters the clam, it triggers a reaction. This reaction causes the clam to secrete multiple layers of a calcium carbonate-type substance, which coats the irritant. Over time, as more layers of secretion coat the irritant, a pearl forms. Clam-produced pearls of the perfect color and shape are quite valuable. They are considered treasured gems because they’re so uncommon, and they are used for jewelry. Machines shuck most clams, which makes it nearly impossible to uncover a pearl. The machines simply aren’t set up to do this. In addition, most clam-produced pearls are so misshapen that they’re not desirable for jewelry. 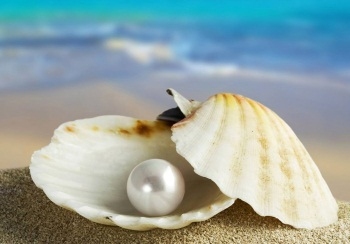 It’s a widely held belief that every grain of sand trapped in a mollusk’s shell eventually becomes a pearl. This is false. Mollusks naturally filter sand out when they open and close. If they didn’t, our oceans, bays and rivers would be loaded with mollusk-producing pearls.